Robot4 (tm) is a Robotic Arm Movement program where the arm is moved from a given position to a desired position. The program finds the angles necessary for the desired position. Problem came from NASA. 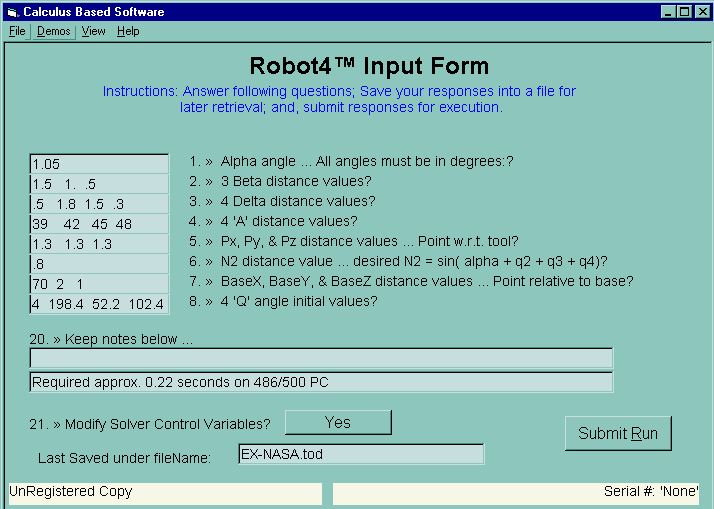 Robot4 is an Inverse Problem example. It wants to solve how to move from starting point 'A' to target point 'B'. Solutions to Inverse Problems are easy with Calculus programming language. See file 'Rob4User.fc' for solution code. This is an improved productivity example do to using Calculus programming. Added another copyright year and improved header in/to output.